To show the speed and usage simplicity of CascAID, we recorded the setup of our detection reaction on paper using Lightbringer to detect the fluorescence produced by the RNaseAlert system. In less than half an hour you can see the increase in fluorescence and determine if pathogens were present in the sample. With our modular approach, we prototype all units of our diagnostic device, and integrate them into a customizable platform. We use cell-free synthetic biology to distinguish between pathogens with our universal detection cascade. We chose to combine heat lysis and isothermal amplification (RPA) to extract our target RNA from patient samples. 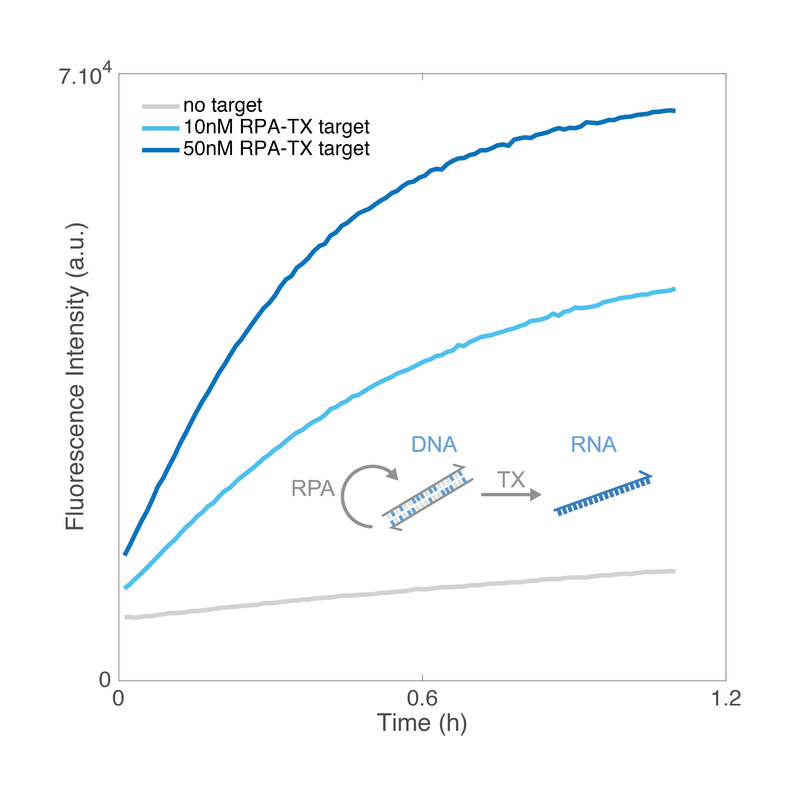 We used RPA to amplify DNA from heat lysed E. coli. We conducted RPA and transcription from an in vitro DNA on paper. We amplified and transcribed an in vitro DNA target to RNA concentrations detectable by our readout circuit. We validated the three necessary modules of the sample processing (cell lysis, DNA amplification and transcription) with a rapid and sensitive method, RPA. We chose Cas13a for pathogen identification because of its specificity for nucleic acid sequence detection. We characterized Cas13a and its detection limit with native and lyophilized protein, with in vitro and in vivo sources of RNA, in bulk and on paper. We designed fluorescent and colorimetric readouts, and used a synthetic aptamer as a detection tool. 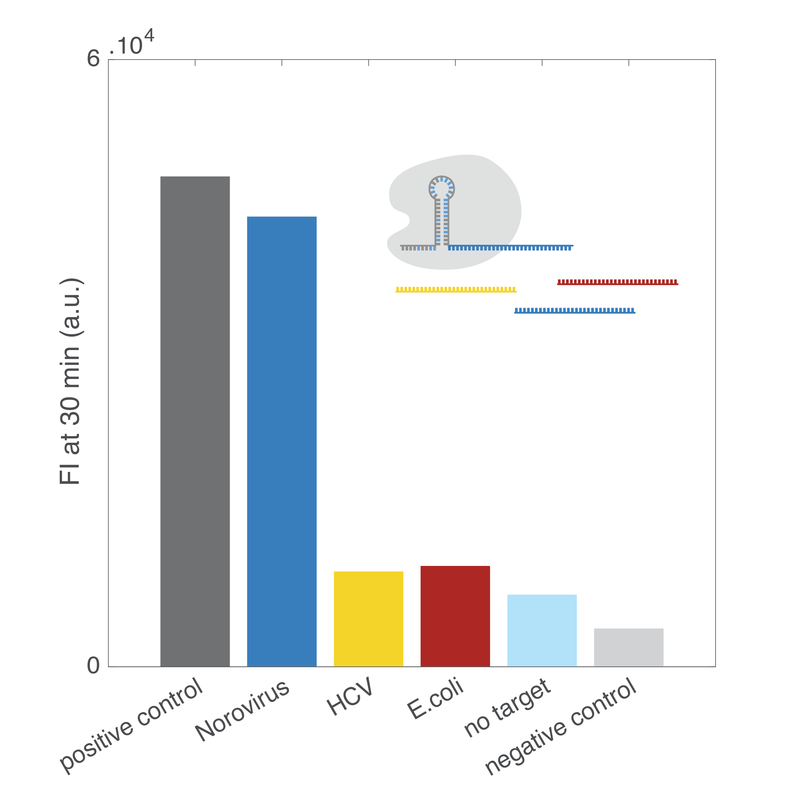 We tested targets from common pathogens and showed the orthogonality of virus detection versus bacterial detection. 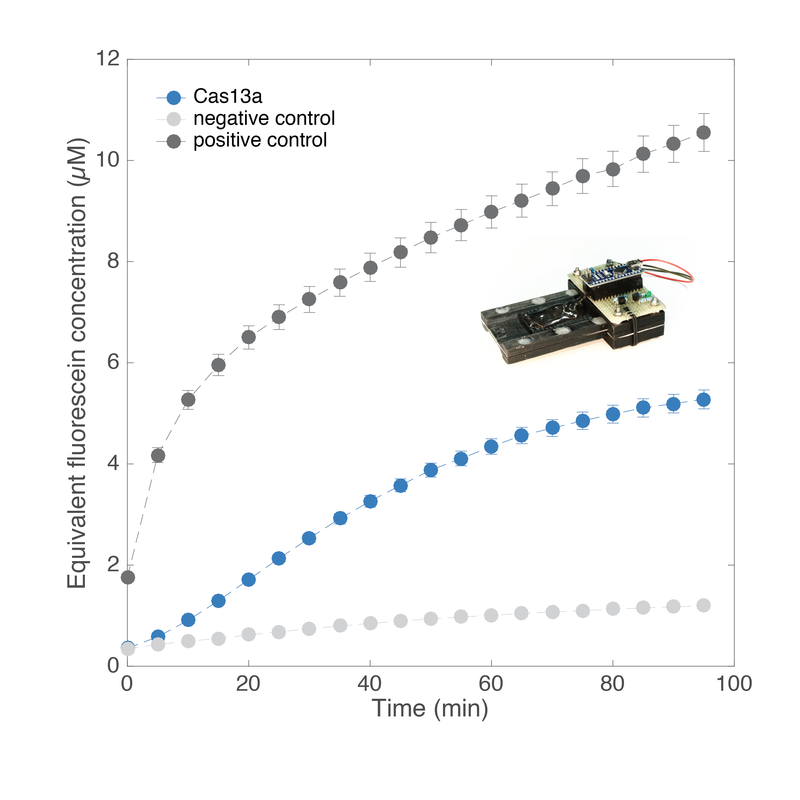 We proved the robustness and universality of our Cas13a-based fluorescence readout circuit. We chose a disposable paper strip combined with a reusable fluorescence detector to analyse our samples. We optimized the paper support for Cas13a functionality. We built the most sensitive and cheapest fluorescence detector ever created by an iGEM team to our knowledge. We successfully used our fluorescence detector to detect Cas13a activity on paper. We created a detection chip that is portable, functional and affordable, for the distribution of our diagnosis device, CascAID.